Remarks: Photograph was taken at Prince Rupert, this pole according to F.W.M. 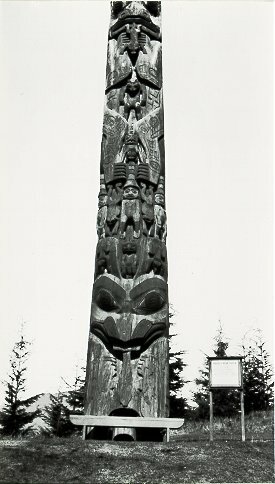 Drew's Totem Poles of Prince Rupert was a house frontal pole that was carved about 1860 and belonged to Chief Albert Edward Edenshaw. It was one of the first Haida poles brought to Prince Rupert by the Canadian National Railways. According to pn1136 which shows this pole in situ, the pole was taken to Prince Rupert in 1923. See page 10 of Totem Poles of Prince Rupert.